A loan of $10,000 helped expand the educational and agri-tourism income streams of my farm business by a projected $70k to $85k per year increase! 1. I wanted to raise my kids in a better environment where family comes first. An environment where my wife and I could teach our kids what really matters in life. A rural family farm is the perfect place for us! I also wanted to make a difference by growing healthy, vibrant and fresh veggies for the local food systems. We have been doing this for 6 years now!! 2. I wanted to teach people how to grow food. Teaching people to grow food for themselves, their families and on a commercial basis makes a much broader impact on food systems throughout the world compared to just producing food myself. I saw Aquaponics as the perfect vehicle for training others to grow food. Aquaponics has many, many pluses over conventional agriculture and it can be done in almost any environment. I have been a successful Aquaponics Farmer for over 6 years. Not only do we produce hundreds to thousands of pounds of fresh veggies every week that go into our local food systems, but we also are able to follow my passion by teaching others from all over the world how to farm and grow food with Aquaponics! It supports a rural family farm that promotes healthy, local, and sustainable food systems. Living Aquaponics Inc started as a small family run commercial Aquaponics farm located on the Big Island of Hawaii. 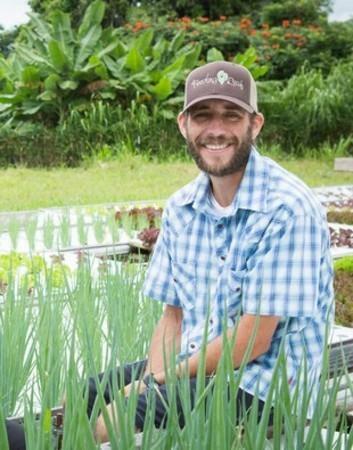 I built this business up to the point that in 2015 we produced tens of thousands of pounds annually of vibrant, healthy veggies that were ALL sold into our local food systems here in Hawaii. We will produce many times that in 2016 and beyond as we are actively expanding our commercial production operations. We STRONGLY believe in a secure farm to table model where people know where their food comes from and that is the basis for our marketing and sales approach. It's really great to be able to sell something we fully believe in and we know helps others! One.....is to infuse as much locally grown, healthy and vibrant food as we can into our local food systems. We produce and sell a lot of food week in and week out, all year long. Two....which is just as or MORE important is to teach others from all over the world how to do the same. We have taught people from all over the world including China, the UK, Egypt, Israel, India, Argentina, Canada, the United States and many more places. These students come to us to learn how to farm using Aquaponics. There is a lot of info out there about Aquaponics and a lot of people selling "How To" seminars and systems but there are very few REAL farmers teaching other people how to commercially produce food using Aquaponics. We teach people everything they need to know all based on many years experience in actually farming for a living. We are an industry leader in Aquaponics education and training! I am not asking for a loan to expand our commercial farming operations. That side of our business is well funded and over the next couple of years we will expand from a small family farm to a major player in locally grow produce in Hawaii. Already in 2016 we have doubled in size and we are in the process of starting a second farm at a near by location. When finished we will be 4 to 5 times larger than we were in January of 2016 and we will be producing tens of thousands of pounds of veggies per month. 1. Managing the commercial production farms we operate 2. Teaching other about Aquaponics and how to farm with Aquaponics. Living Aquaponics Inc is our education and agri-tourism entity and farm managing entity. This loan will help me expand our diversified income streams that are our educational and agri-tourism programs. I project this loan will allow us to grow this side of our business from $15,000 to $30,000 annually to well over $100,000 annually. This is in addition to our commercial crop production income streams we have from our commercial Aquaponics farms. As a small fish in a large pond the local food producer MUST diversify their income streams or face real issues at some point in their farming careers. Weather, pest, disease, competition, changing demand throughout the year and many other factors can affect what the local farmer makes income wise. We as farmers are not in the business of producing widgets that come off the assembly line exactly the same and at the same rate all the time. Farmers must work in a dynamic environment where many things affect crop production and thus most local farmers see income swings throughout the year. While our farm has always done well there are definitely up and down times of year driven by things like the seasons (yes there are seasons in Hawaii that affect plant growth etc) and other factors. Having other streams of income that are related to our farm but not crop dependent is what insures we will be here year in and year out. It's the smart move for all local farms and we teach ALL of our students this. We have chosen education and agri-tourism as our diversification of income streams. We make great money from the sales of our crop production and we back that up by teaching other about Aquaponics and how to farm using Aquaponics. As a local food producer having all of your "eggs in one basket" is not a good idea. Finding alternate income streams is the key and Aquaponics lends itself to having many diversified income streams from one farm enterprise. Again we have chosen education and agri-tourism as our other income stream. Right now about 85% of our income comes from the production and sales of the food we grow. We are commercial farmers. The other 15% comes from teaching and educating others to grow food with Aquaponics. We offer various training programs and students come to us from all over the world to learn to be commercial Aquaponics farmers. Our education/tourism based income streams generate this income with very little infrastructure and advertising. People find us and seek us out to train them. There is HUGE potential for expansion of this income stream. Right now we do between $15,000 and $30,000 per year in education/training business. People find us via our Facebook page (9000+ followers) or our website or word of mouth and come to us to learn how to farm with Aquaponics. Being in Hawaii helps as most students use it at a way to have Hawaii vacation as well as their jump start into Aquaponics farming with the industry leading training programs we offer. We have taught people from all over the world. There is a HUGE potential to train a lot more than we do. 1. Currently students must find and pay for their own expensive vacation rental housing while here on island for their Aquaponics training. Some of the loan proceeds will go complete an existing structure on one of our farm properties. This structure will be for accommodations for students coming to Hawaii to learn from us. This means I will be able to offer on farm accommodations to my students. Not only does this give students more time on our farm but also means the overall training experience will cost the student less money. I can raise the cost of my training programs by 10% to 15% and it will still be much cheaper for the student as they will not have to pay for an expensive vacation rental accommodation somewhere near by while here learning from us. I project this will not only make more money in higher training fees charged but we will sell a LOT more trainings as it will make it much more affordable to the student. We get inquiries on a very regular basis for a cheaper option. This on farm accommodation will also act as a farm based vacation rental when not in use by students. Farm-staycations are becoming more and more popular. There is a huge income potential in offering on farm vacation accommodations for tourists that want something different in their Hawaii vacation. More and more people are seeking out farm based vacation accommodations. We live in one of the world's most sought after vacation destinations. We also have a very unique farm. This vacation rental will make a very good income! The loan proceeds used for this item will go to making an already built structure into a nice place for students and vacationers to stay. The money will go to installing a kitchen as well as furnishings. This structure is located on our newest farm location overlooking where we are currently building a large commercial scale Aquaponics system as well as overlooking a 180 degree panoramic view of the Pacific Ocean and Kona town. It’s the perfect location to house Aquaponics students and vacationers who want a farm experience. 2. Part of the loan proceeds will go to web based infrastructure. Our website needs an overhaul and needs better ranking in google searches etc. Currently we make a good secondary income teaching people how to farm with Aquaponics without much advertising at all. With the right web base infrastructure and advertising in place I project our sales of training programs, farm based vacation stay etc to go up many times it current amount. Part of this loan's proceeds will be used specifically for website overhaul including online web store with web based training/learning options, google ranking, Facebook advertising and more in order to better advertise our training programs and farm vacation rental program. There are almost 600,000 average monthly searches on Google relating to Aquaponics. Within that number are hundreds to thousands of specific searches for things like Aquaponics how to, Learn Aquaponics, Aquaponics business plans, Aquaponics system design, Aquaponics education and many more searches relating to learning Aquaponics. We provide our students with all of this and more and we plan to actively reach out to these searches. This means a projected income of over $100,000 annually once fully up and running. That is an increase from between $15k and $30k annually at this time for the education and agri-tourism income stream. In closing, our farm business has been 6 years on the making, we have proven ourselves as real commercial farmers that have withstood the test of time. We are the real deal, farming every day and making a good living doing it. This loan will help us expand our diversified income stream of farm based education and tourism to its full potential. Once both our commercial farm production and our educational/tourism income steams are fully expanded we plan to start a community out reach program teaching children in our community to grow their own food. Its a long process and a lot of work but its good work and at the end of the day we are building a successful business that produces a LOT of healthy food, teaches others from around the world to do so as well and has plans for the future of focusing on the children in our community, because lets face it...our kids are our future. ***Upon request: I can provide a detailed income stream plan to include projected cash flow over the next three years as well as detailed info on how the loan money will be spent as well as more information on the specific advertising we plan to do for both the training programs and the vacation rental programs.